Is There Such a Thing as Alien Abduction Insurance? You've heard about all the different kinds of insurance you should have, but what about Alien Abduction Insurance? You can buy something called "Alien Abduction Insurance" if you are worried about the impact an alien abduction might have on your life. Alien abduction insurance does exist, here's a complete overview, of what Alien Abduction Insurance coverage is, along with where you can buy coverage and how it works. What Is Alien Abduction Insurance? Alien Abduction Insurance (AAI) also known as UFO insurance is supposed to cover you in the event that you can prove that you have been abducted by non-human life forms, more commonly known as aliens provided the terms and conditions of the policy are met along with conditions that would substantiate the proof. 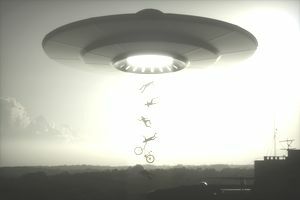 Different companies have taken different approaches to Alien Abduction Insurance, some are more gimmicky and suggest you give their insurance as a "gift" and other products of Alien Abduction Insurance have actually come from, or are currently being developed by serious home or life insurance companies. In the cases we review, whether gimmicky or not, some have actually paid claims. Who Buys Alien Abduction Insurance or UFO Insurance? In the same way that you buy insurance for regular everyday things that you are worried about suffering a financial loss from, a person who is worried about not having the financial resources to recover from an alien abduction, UFO abduction or non-human abduction incident, may decide to buy insurance to protect themselves from this with Alien Abduction Insurance. Concerns about UFO's and alien abductions in the USA go back decades, yet to this day despite our fascination and interest in the extra-terrestrial life, we can't say that we have heard any confirmed stories. In the USA, from 1947 to 1969, the U.S. Military conducted research on a total of 12,618 sightings reported to Project BLUE BOOK, out of these reported sightings 710 remain unidentified according to the U.S. Air Force Fact Sheet Concerning UFO's and Project BLUE BOOK. More recently, there was a Pentagon study of UFO's that lasted roughly from 2007 to 2012. Does UFO Insurance Make Sense? Then they make a business decision that it is worth the risk to issue a policy. If an insurance company collects more money in premium than they pay out, then they will profit. Investigations of unidentified flying objects naturally lead us to wonder what aliens might be doing, why they are here? We've all heard stories and seen countless movies or "documentaries" on people who report having been abducted by aliens, but without proof or having experienced these things ourselves, it is normal for people to question if it is possible, or fear the possibility. What Does Alien Abduction Insurance or UFO Insurance Cover? cash settlement payouts for non-human or alien abduction, alien pregnancy (with the possibility of coverage for men or women), alien examination and death caused by aliens. Every insurance company is different, especially when it comes to these unusual types of coverage, so make sure and ask what is covered and how the payments are made. This type of insurance is not something that is standardized, so beware that you are really taking a chance when buying into a policy. You need to review all the details and paperwork carefully. Where to Buy Alien Abduction Insurance? According to Insurance Business Mag in 2018, Budget Insurance in the UK, based in Peterborough has started promoting a new Alien Abduction Insurance policy option, and offering to add their homeowner policyholders to a waiting list for it if they are interested This is a very interesting approach because of the fact that it is based on current discoveries by NASA rather than the fear of the past. One major problem with Alien Abduction Insurance is that it is such a fringe insurance product a lot of people don't really know a lot about it. Finding valid information on where to get it is tricky. For example, in researching this article I found so many sources referencing the U.K. London-based firm Goodfellow Rebecca Ingram Pearson as a firm selling the insurance. Although this is not a U.S. based firm, it still gives a good example of how the information you may find online could be dated or misleading. Apparently, this firm had sold more than 30,000 policies according to Forbes in 2011, (this fact got cited multiple times in multiple places) however, a more recent article in 2014 cited that the firm had discontinued the coverage, and cited only 4,000 policies had been sold. The information was quite different, and so deeper investigation revealed more about the situation: An article in the Chicago Tribune in 1997 quoted Simon Burgess, managing director of the Goodfellow Rebecca Ingrams Pearson insurance company, explaining that due to a cult suicide, whose cult members had purchased the insurance, they were withdrawing from the alien abduction insurance business given how the insurance ended up being used in such an unfortunate unforeseen situation. Then in 1998, the San Francisco Gate said they had resumed sales for Alien Abductions. After all this, the latest in 2016 cited the company no longer operates and suggested a history of gimmicks. How Much Will Alien Abduction Insurance Pay? Although finding any evidence for you of claims paid out for Alien Abduction Insurance Claims was rather difficult, I did find one case to share. Keep in mind that every policy is different, and who knows how this field may evolve in the future, but as of this writing, here is the one that seems to be based on a claim where the person had "significant enough proof" to be paid. If you are interested in a policy like the one offered by UFO Abduction Insurance Company, whose President Mike St-Lawrence offers the insurance as a bit of a novelty, he confirmed he has actually paid a claim. You'd be looking at a potentially huge payout, but the catch is, it is only paid at the rate of $1 a year. Read your policy wording before buying an "Alien Abduction Insurance Policy" to understand how the claim would be paid out. However, at that claim payment rate, buying the policy truly is more of a gimmick for fun than something that is going to assure your financial stability or help you recover from any potential loss.